Saturday’s Save Pier 6 “Town Hall” attracted, by my estimation, about 100 attendees. Among these were representatives of a number of elected officials, including U.S. Representative Nydia Velazquez, State Senator Daniel Squadron, newly elected State Assemblywoman Jo Anne Simon, and City Comptroller Scott Stringer, as well as 52nd Assembly District Democratic Leader Josh Skaller. 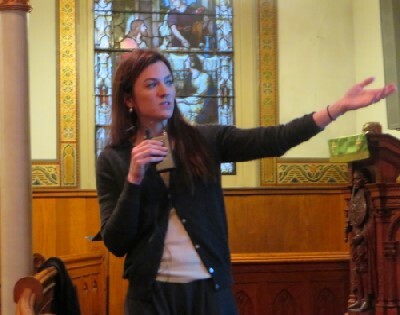 The meeting began with a presentation by Save Pier 6 leaders Martin Hale and Lori Schomp (photo), along with Ren Richmond, who focused on alleged errors and lack of transparency in Brooklyn Bridge Park Corporation’s financial projections used to justify the need for two high rise residential structures near the Park’s southern entrance at Pier 6. Hale characterized the Park’s overall plan as being “as fresh as Lindsay Lohan.” He was supported in this by Josh Levin, of Comptroller Stringer’s office, who noted that it had been over ten years since “a proper assessment” had been seen, and by Dan Wiley, of Representative Velazquez’s office. Wiley said the plan should take into account the drastic changes in the Park’s neighborhood brought about by the “terrible debacle” of Long Island College Hospital’s closure and conversion largely to residential use. The Park, he said, isn’t “looking at the bigger picture” and it seems it “just wants to max out” allowable development. Steven Guterman of Save The View Now then took the floor. He said STVN, which seeks to preserve views from the Promenade and the Fruit Street Sitting Area that are, or may be, impeded by the construction of Pierhouse, had asked eight questions of Brooklyn Bridge Park Corporation’s management, but had received no replies. He contended that the 2005 agreement concerning the height of what has become the Pierhouse structure was incorporated into the Park’s FEIS, and that the Request For Proposals that led to the award to Pierhouse’s developers required compliance with the FEIS. As the height of the Pierhouse’s main structure now exceeds the height limit set forth in the 2005 agreement, it is in violation of the FEIS, which is binding on the developers, and the portion of the structure exceeding the limit must be removed. He also said he had checked plans for “Parcel B,” the portion of Pierhouse to the south of the (now closed) Squibb Park pedestrian bridge, the construction of which is just now getting above ground level. He said plans on file at the City Department of Buildings appear to show the building exceeding the agreed height limit of 55 feet. He said he has made an inquiry to the DOB, and that STVN has support from State Senator Squadron in this effort. If true, Guterman added, he had information indicating that the Parcel B structure would interfere with the designated View Plane. The Park contends that, as the 2005 agreement was never included in the Park’s General Project Plan, current Park management was not aware of it and accordingly did not include it in the Request For Proposals; moreover, Park management remained unaware of it throughout the public review process for the Pierhouse design. The Park’s position is described more fully in Park President Regina Myer’s piece in Gothamist. The controversy over Pierhouse and the efforts of STVN were the subject of this New York Times story that appeared in this Sunday’s paper. Meanwhile, there was much previous discussion about the number of visitors to Brooklyn Bridge Park, which was answered in the recent Wall Street Journal article about BBP. My repeated queries to the BBP never got this number, but the WSJ has it. The answer: from May to August last year, an astounding 4.5 million people visited. And we know how park attendance has impacted the Heights: greatly increased traffic, both car and pedestrian, plus possible hooliganism on Hicks Street, and lots of illegal parking from people who want to drive everywhere instead of taking the subway. Then there are the crowds who have drastically changed the character of Willowtown by walking in their thousands down Joralemon Street. None of this has been addressed by BBPC!